Need a Mercenary? Introducing Captain Koska. We understand that the Realms of Heroes can grow large enough that it cannot hope to be contained. Many of you have been asking for a bigger box for your collection. With that in mind, Legion Supplies has your answer here. But what if the box is too big now? Well…we have the answer for that too! Each deckbox comes with a copy of Captain Koska. The good Captain, a frequent visitor to the port city of Thandar, will happily join your team for the merest 4 coins. Not only that, but our intrepid mercenary is uniquely skilled at blending in to the teeming mass of Thandarian citizens. Politics, gang violence, corruption, and death…Captain Koska is skilled in all of these areas. When you play Koska, (or when Koska starts the turn in play), they have no alignment. The alignment is chosen when Koska is expended, so you can see which of your Ally abilities will be more favorable to trigger before you use the good Captain. Not only do you get Koska, each deckbox comes with 200 Hero Realms sleeves. 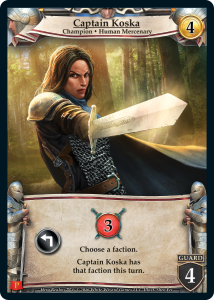 Sleeves all have the Hero Realms card back design. Like so. You can also buy additional sleeves on the Legion Supplies website. You’ll need all the supplies you can get when you and your team face the trials and tribulations of Hero Realms: The Ruin of Thandar, coming soon to a Friendly Local Game Store near you! And if you’re a member of the Boardgame geek community, we would love your vote to get Ruin of Thandar as one of the 20 most anticipated games of 2017! Kickstarter Card and Lore Preview #2: Relics! 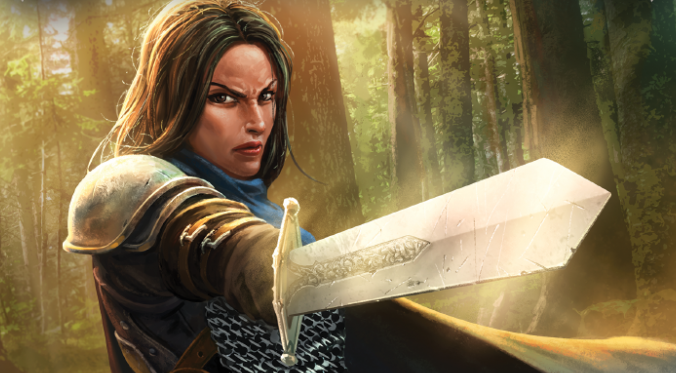 Kickstarter Card and Lore Preview #1: Quest Cards! Prepare your party for Hero Realms: Journeys, coming to Kickstarter in November! 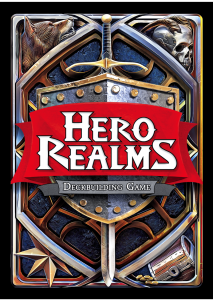 Subscribe to our newsletter for Hero Realms product updates and White Wizard Games news.